Ably filling in as doubles for William and Kate, the Duke and Duchess of Cambridge, were Andy Walker and Jody Bredo. Standing in for Bavaria's famed King Ludwig II, who also had other commitments, was Siegfried Mathes (3rd from left). 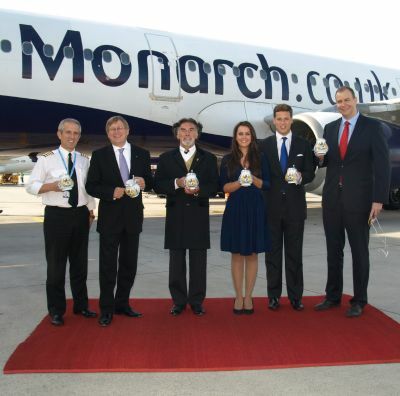 Alongside the royalty on the red carpet to celebrate the occasion were Munich Airport CEO Dr Michael Kerkloh (2nd from left), Jochen Schnadt (right), the head of Monarch Airline's commercial operations, and Flight Captain Simon Turner (left).